Iguazu Falls, also known as Iguazú Falls, Iguassu Falls, or Iguaçu Falls, isn’t just a waterfall but up to 300 individual waterfalls that bridge the border between Argentina and Brazil making it the biggest waterfalls system in the world. The falls live inside protected national parks, Iguazú National Park (Argentina) and Iguaçu National Park (Brazil), both parks were added to the list of UNESCO World Heritage Sites in the 1980’s. The spectacle of the falls is an incredible display of nature, absolutely dwarfing the likes of Niagara Falls in size and beauty, sorry North America. The volume of water, the sound roaring and the mist flying at Devil’s Throat are indescribable. In my humble opinion, it is an unmissable experience of the grandeur of nature, a must-have on anyone’s bucket list. The combination of unforgettable views and up close encounters with native wildlife in their natural habitat (I saw coatis, monkeys, macaws and even a tarantula!) have made this one of my favourite weekend getaways of all time. Getting to Iguazu Falls is fairly straightforward however it takes either a lot of time or a lot of money. The bus from Buenos Aires to Puerto Iguazu will take you 18 hours, and if you have more time than money it’s a good option. Buses leave Buenos Aires several times a day from Retiro station and a return trip will cost about half the price of flying. Backpacker chic is my usual mode of travel so an overnight bus to save accomodation money is right up my ally. However, I chose to fly solely for the sake of my parents’ travelling comfort and to be as economical with time as possible during their very short visit. Booking a flight was not as straightforward as I have experienced in the past. After a generous amount of time scrolling websites and comparing prices, I settled on return flights for 2000 pesos per person but I couldn’t make the purchase. After a few emails back and forth with customer service, it came to light that this was in fact the price for Argentine citizens (locals get a government subsidized price) and the transaction was not successful because my visitor’s ticket price would actually be 3500 pesos. A big price difference and a bit of a surprise as it seems all flight compare websites show you the significantly lower rate. There are a lot of opinions about length of time needed to see the falls, some people even suggesting that if you are pushed for time both the Argentine and Brazilian sides could be seen in one day. The thing is if all you really want to do is to look at the waterfalls, one day actually would be enough, but there is a lot more to the national parks, Puerto Iguazu, Foz do Iguacu and the province Misiones than just the waterfalls. I decided to book for a three full-day trip as I stumbled upon other attractions nearby that I wanted to check out, such as San Ignacio Ruins and the Parque do Aves. I am so glad I gave myself that extra day, and to be honest, I could have stayed even longer. I could easily spend two full days on the Argentine side alone! Where to stay in Iguazu Falls? There are several options when deciding where to stay while visiting the falls. Both national parks have high-end hotels inside, with views of the falls. If you have the budget, this would be a great add-on to your falls experience because you’ll also have access to the falls at night which are closed to the public after sun down. 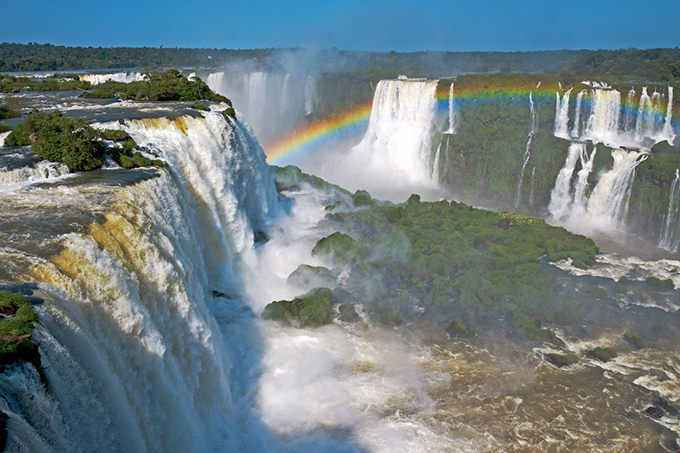 Since the falls are located just a short drive to their respective cities, Puerto Iguazu, Argentina and Foz Do Iguaçu, Brazil, there are endless hotel options ranging from budget no frills inns to luxury resorts for your choosing. After much research, we have settled with a hotel in the city on the Argentine side. There are several companies offering all sorts of activities. We decided to consult with Vamos Spanish Academy, a popular Spanish School in Argentina that offers Spanish classes but also cultural and social activities. They recommended a tour through the province of Misiones to the ruins in San Ignacio and the gem mines in Wanda. Our second tour took us across the border to the Brazilian side of the falls. Both of these tours were about 500 to 1000 local pesos and did not include entrance fees to the ruins or the National park. It did however include a free airport transfer to our hotel when we arrived. I cannot overstate the convenience of getting picked up and dropped off at your hotel, letting the tour company deal with customs (crossing over the Brazil) and having bilingual Inglés/Spanish-speaking tour guides. There are also adventure tours involving jeeps, speed boats and helicopters run from inside the national parks on offer.